Federal regulators are suggesting that Shell’s disputed oil leases in the Chukchi Sea be left intact. That’s the conclusion of a new assessment of Lease Sale 193 — the auction where Shell and other companies spent more than $2 billion on Arctic drilling prospects. The Bureau of Ocean Energy Management released its final analysis today, almost a year after a federal appeals court ordered them to double-check how much development the sale would trigger in the Chukchi. Regulators had previously guessed that 1 billion barrels of oil would be drilled on lease sites. But after a lawsuit from environmental groups and tribal governments along the coast, Judge Ralph Beistline ruled that was an arbitrary figure — and it cast doubt on the government’s justification for the sale. Now, BOEM has revised its estimate, saying that oil companies could get more than 4 billion barrels out of the Chukchi. But that hasn’t shifted BOEM’s opinion about the scope of the sale. Federal officials traveled around the state this winter, holding public meetings on the new study. BOEM accepted comments on a draft version for over a month. But Leah Donahey of the Alaska Wilderness League says that timeline feels fast. The public comment period didn’t close until late December. This isn’t the first time that BOEM has had to go back and re-check the sale. Judge Beistline made a similar order for extra studies five years ago. 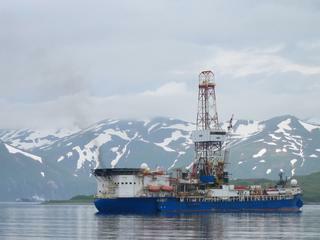 Once they were complete, the judge allowed Shell to go on and explore its leases in the Chukchi. That kind of activity is off-limits for now. First, Interior Secretary Sally Jewell has to issue a final record of decision on whether to uphold the sale, adjust its parameters, or strike it down altogether. Jewell is required to wait 30 days before releasing that decision. The waiting period ends March 25. APRN’s Liz Ruskin contributed to this report.